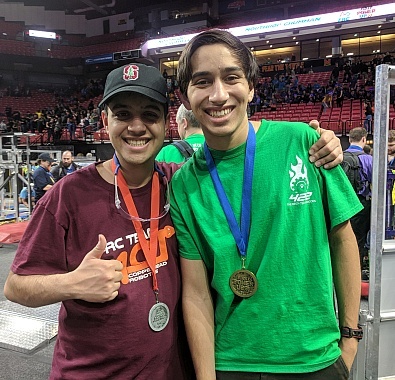 FIRST Alum Alex Kaplan was a participant on FIRST Robotics Competition Team 1086 “Blue Cheese” from Deep Run High School in Glen Allen, Virginia, where he gained a lot problem-solving experience as his team overcame various obstacles. Today, Alex is working on a graduate degree in aerospace engineering at Stanford and preparing for a SpaceX internship in pursuit of a career in the space industry. He also mentors two FIRST teams. “FIRST gives you a safe place to fail. You can try new things and learn from your mistakes,” he says. I completed my undergraduate at Virginia Tech in aerospace engineering. I used my FIRST experience to help with my senior design project: helping to design a robot for the NASA Mining Competition. I also took a class at Virginia Tech where I helped mentor FIRST Robotics Competition Team 401. I am currently working on my graduate degree at Stanford in aerospace engineering. This upcoming summer I will be interning at SpaceX in Los Angeles, and I am hoping to be able to stay with Space X or another private space company. FIRST gives you a safe place to fail. You can try new things and learn from your mistakes. The only thing that matters is the time when you succeed. The different obstacles my FIRST team overcame has given me a lot of problem-solving experience. After I graduated, I became a mentor on FIRST Robotics Competition Team 1086. In 2016, I helped Team 1086 while my brother was a senior on the team. They were on the winning alliance on Einstein, so it was great to share that experience with him. At Virginia Tech, I took a class where I mentored Team 401. As the years have passed and I am pursuing my degree, I have become a remote mentor for both 1086 and 401. During my spring break I was able to attend both a FIRST Chesapeake District Event and the FIRST Chesapeake District Championship. It was amazing to see 401 and 1086 and work with them in person. As a FIRST Alum and a FIRST mentor, it doesn’t matter what team you are from; it matters what you make from the experience. The people who ultimately get the most from FIRST are from teams that have to be scrappy and try hard. The most important takeaway from FIRST is that you should never be happy with good enough. There is always room for improvement and you have to keep working until you get it right. Work hard and give back to others and you will be successful. Do you dream, like Alex, of exploring space? Alex’s FIRST experience gave him the confidence to reach for the stars. This season, FIRST programs will blast off with space-themed challenges as we celebrate the 50th anniversary of mankind’s first walk on the moon. You won’t want to miss this exciting season….